An integrated method for bilingual chunk partition andalignment, called “Interactional Matching”, is proposed in this paper. Different from former works, our method tries to get as necessary information as possible from the bilingual corpora themselves, and through bilingual constraint it can automatically build one-to-one chunk-pairs associated with the chunk-pair confidence coefficients. Also, our method partitions bilingual sentences entirely into chunks with no fragments left, different from collocation extracting methods. 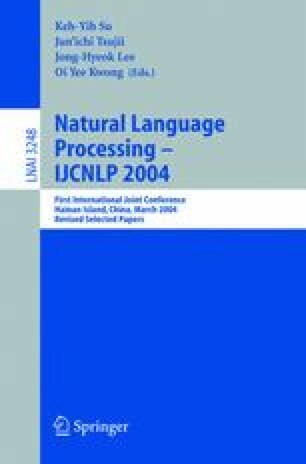 Furthermore, with the technology of Probabilistic Latent Semantic Indexing(PLSI), this method can deal with not only compositional chunks, but also non-compositional ones. The experiments show that, for overall process (including partition and alignment), our method can obtain 85% precision with 57% recall for the written language chunk-pairs and 78% precision with 53% recall for the spoken language chunk-pairs.